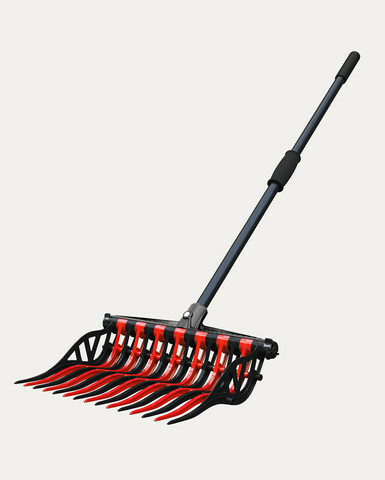 Noble Outfitters™ Wave Fork is an unbreakable, lightweight, and customizable manure fork. The aircraft grade aluminum handle is strong enough to support heavy loads all while feeling light with comfortable plush hand grips. The heavy duty I-Beam rail and tines were designed as a one-of-a-kind interchangeable assembly. Choose from multiple colors to customize by simply slipping on the tines, with the rail set ends completing the “basket” feature. This revolutionary fork adapts to the task with a copolymer plastic resin construction that allows the tines to bend without snapping. The space between the tines has been optimized to work more efficiently and effectively while offering a complete ergonomic experience. •All Wave Fork™ items ship separately.